Thanks to some strategic re-scheduling, it appears that this weekend has become LA Design Conference-Palooza. It all started when AIA Los Angeles decided months ago to merge its Mobius conference with the popular Dwell On Design. Both shows will be held at the La Convention Center this weekend (June 25-28). All was well with the world.. But then came more recent news that design entrepeneur Charles Trotter had rescheduled his March design show, CA Boom, for the same weekend, at the former Robinsons Department Store in Beverly Hills! Well then all hell broke loose... The good spin: we have a new design weekend LA. The bad spin: attendees and vendors have been forced to choose sides, and both shows will suffer on account of the move (and Dwell employees are particularly peeved that CA Boom has roped in the Coolhaus ice cream truck, which was also set for the Dwell show). Regardless of what side of the debate you sit on, it certainly will be an entertaining weekend in LA. Some highlights: A screening of the new film Visual Acoustics: The Modernism of Julius Shulman, as well as conversations with Williams Krisel, Yves Behar, and Peter Walker at Dwell on Design. An AN/SCI-Arc panel about architects getting involved with transportation design, featuring architect Eric Owen Moss, LA Planner Simon Pastucha, METRO art and design director Jorge Pardo, and Art Center College Mobility Director Geoff Wardle at Mobius. And tours of Pierre Koenig's Case Study House #22 (the Stahl House) at CA Boom. Hold on to your seats, folks..
Update: Wrong Matteo Thun knives. More after the jump. We've been all over the architecture/fashion hook-up, but what about cooking? Age-old knife maker Zwilling J.A. Henckels has just announced a new set of knives designed by Milanese architect Matteo Thun. They certainly look nice, enough so that your culinary-inclined editor considered getting a pair. But the Times talked to Thun about the knives last year, which, it turns out, cost between $300 and $450. That's well out of our meager price range, but hearing Thun justify the exorbitant cost is worth it all. What makes a knife worth $450? You know, Manolo Blahnik, of course. What happens if you look in the window? Nothing. The heels are way too high. So are the prices. Probably if you fall in love with a Manolo piece, you can’t say why, but it’s definitely a dream. The dream costs you an unbelievable $400, $500; there are many Manolos over $1,000. But if I were a woman, I would go — this is my true answer — I would go for one Manolo every two years, rather than five whatsoever. So it’s all about beauty? It’s a combination of the very warm ebony and the high performance of the steel blade. It’s a bit like driving one of those fabulous Lamborghinis. It’s a dream. But you remember the words of Goethe. He says one takes hold with the eyes and sees with the fingers. Does Mr. Thun drive a Lamborghini? I was driving one two days ago, but for a very simple reason: Lamborghini has V.I.P. cars for free. 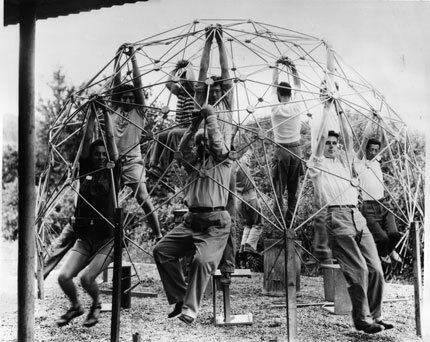 The work and ideas of Buckminster Fuller have been an important touchstone for many of today’s architects, designers, and artists. 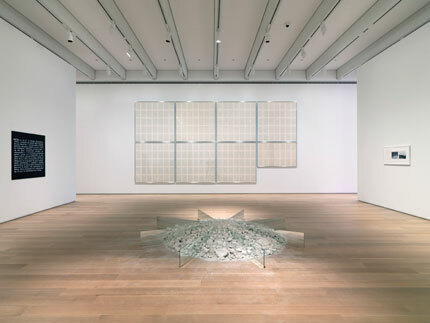 In her essay for the Whitney Museum’s publication that accompanied the recent Fuller exhibition, Elizabeth Smith, chief curator at Chicago’s Museum of Contemporary Art (MCA), traced these influences on a current generation, including Danish-born artist Olafur Eliasson. 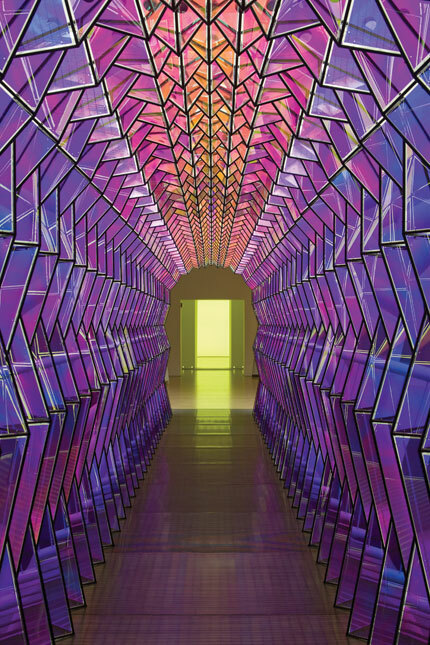 With major exhibitions on both Fuller and Eliasson now on view at the MCA, AN asked Smith to discuss Fuller’s continued relevance, interest, and significance with Eliasson. Elizabeth Smith: You’ve been thinking about Fuller for a long time. What is it about his work in relationship to your own that you find productive? Olafur Eliasson: With Fuller’s work, there’s experimentation on so many levels, and of course I have been inspired over the years again and again, beginning with one of my very first pieces titled 8900054. Principally, it was a Fuller dome, and that was the first time I worked with a mathematician and geometrist called Einar Thorsteinn who was a friend of Fuller. My idea was to make a work almost like a Fuller ready-made. At that time, in ’96, he was not at all exposed in the architectural frame of reference, so people reacted to him as a utopian and a person who was very hard to map within the context of spatial thinking. What is exciting and interesting is that in the last 15 years, he’s been integrated into architectural or spatial history in a much more performative and productive way. Tell me more about Einar Thorsteinn and your collaboration with him. Well, there is so much to be said about him but most importantly, he was educated in the late 1960s at Frei Otto’s office in Stuttgart, and he was involved as a student with the erection of the Munich Stadium that became so famous with the tensile suspended roof structures. Einar then went back to Iceland. 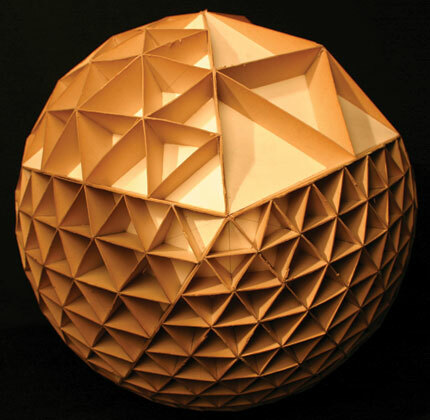 In 1973, he founded Constructions Lab and although involved with architecture, he moved on into different types of mathematical and geometrical research. He also invited Fuller, whom he had first met in ’66, to come to Iceland. Einar had done a handful of dome houses where people are actually living to this day in Iceland. On top of that, Einar is an artist himself and is developing a number of different projects on his own terms. He has worked in my studio for more than ten years now, and when I say work, I mean that he is deeply involved as a collaborator, and sometimes solves pragmatic challenges with me. Coming from Frei Otto and Fuller, through crystallographic and spatial pattern principles that typically derive from non-modern or non-Euclidian languages, Einar is of course a great resource and of much inspiration to me. I myself have looked into both Fuller and Frei Otto but also into people like Paolo Soleri and Felix Candela and others, who have had these utopian approaches. The inspiration is not necessarily a formal one, based on the language they created; I do think that one of the most striking things about these people and Fuller especially is their conviction in the worth of what they were doing. They would link social aspects with engineering and environmental questions. They would not compartmentalize things like one sees in the general architectural practice of today; they would challenge everything at the same time in a very productive way. Well, as an artist, I look for languages where I can examine and challenge ideas about singularity—about the person in the world—and about plurality—about collectivity in the world. Fuller successfully created a language that sustains a clear notion of what individuality potentially could be and the sense of responsibility that an individual has. On the other hand, within that language, within that same question, he also has a specific idea about collectivity and its consequences and what kind of responsibility that requires. If you think about it, there are not so many types of spatial practice that would sustain both an explicit idea of individuality and an explicit idea of collectivity. You could say that typically, you have either collective kinds of spaces or spaces that are very much based on individuality. And today I find that we have to take up the great challenge in society to embrace collectivity and individuality rather than polarizing the two, which is the case on the political scene, for instance. Was agency of the individual as important an idea for Fuller as it is for you? I’m not saying that he was not a utopian thinker who to a great extent externalized fundamental values into a kind of a dot on the horizon where we would want to be heading. I think he was, as were his contemporaries, utopian in the sense that he implicitly worked with this idea of, “Once we get there, we will be fine.” Where clearly now, both as an artist but also as a participant on Spaceship Earth, I say we have to be fine while we go along, and it doesn’t work to externalize our values into a certain goal; the process with which we move along needs to perform the values by which we live. So one could say that there has been an internalization of Fuller’s values in terms of his utopian tendencies. The struggle we see in architecture today is: To what extent can one embody the environmental movement, the green movement? In architecture there is that little bit of struggle now whether we should be modern and claim a goal and then create a green movement, or whether we should try to mobilize, create an architecture based on our individual sense of responsibility. One could split those two kinds of architecture into a normative architecture, which is the modern one that tries to create a generalized idea of how we sustain ecological architectural principles, and this is something that Fuller in a sense initiated, and a more non-normative movement that we individually define because this also allows for a different kind of emotional involvement. To me it seems that Fuller’s approach is as much about setting a goal and pragmatically reaching it as it is about living one’s life in a way that significantly demonstrates ethical values. Looking at Fuller’s work, the question is also, what does an exhibition like this do? I think there is an incredible potential in Fuller, but how are his theory, his arguments, values, and tools reintroduced to a contemporary spatial practice? How does one see the tools in today’s context rather than as historical tools? I’m very interested in that question: Are we looking at new drawings by Fuller that happened to be made 50 years ago, or are we looking at 50-year-old drawings today? I think it’s incredibly important to consider his contribution contemporary. I think we need to adopt a contemporary view as we walk into the museum and we have to imagine that Fuller is a 23-year-old architecture student. That activates or introduces a certain performative aspect to an exhibition like the one at the MCA, which I think can be strikingly convincing. I find it productive because clearly, the effort in the show has been to describe the legacy of Fuller, and he in every way deserves that and it hasn’t been done so far. But we also have to acknowledge that this can be slightly stigmatizing because you suddenly see the tools in a vitrine rather than in your hands. And as an artist I believe that one of the great challenges, and one of the great things about art, is that it insists on being in your hands rather than in a vitrine. So I think the greatest potential of a show like this becomes apparent if we consider it a fully contemporary exhibition. 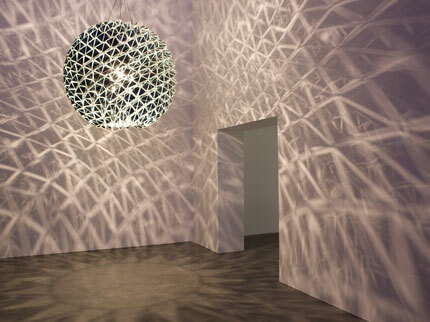 At the Museum of Contemporary Art, Chicago, Buckminster Fuller: Starting with the Universe is on view through July 5 and Take your time: Olafur Eliasson is on view through September 13. 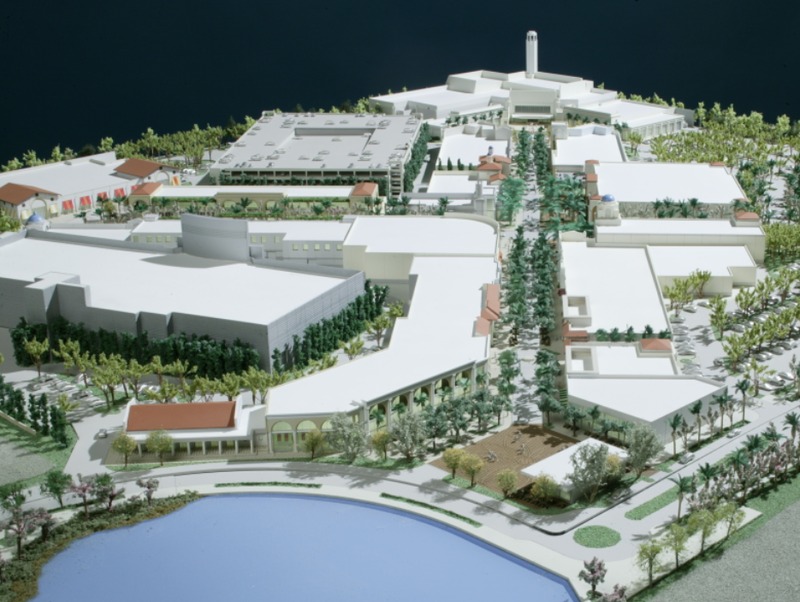 The $180 million project would create a new Anaheim landmark while helping anchor California's future high-speed rail network. 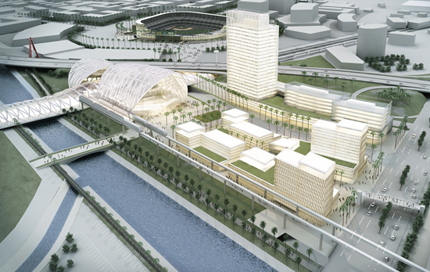 HOK’s Los Angeles office, with Parsons Brinckerhoff, has defeated some of the world’s top architectural talent to win the commission for a major new transit center in downtown Anaheim that’s envisioned as a hub for California’s future high-speed rail network, as well as for Amtrak, commuter rail, and other regional transit lines. 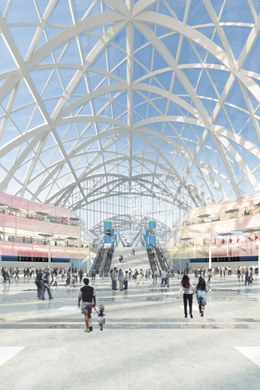 Other teams shortlisted for the project, known as ARTIC (Anaheim Regional Transportation Intermodal Center), had included RMJM with Gehry Partners and AECOM; Santiago Calatrava with Jacobs; Pelli Clarke Pelli with AAI; SOM with Parsons; and Foster + Partners with Gruen Associates. Firms who originally applied for the RFQ in February included Arup, Robert A.M. Stern Architects, and Morphosis. The $180 million, 16-acre project, commissioned by the city of Anaheim and the Orange County Transportation Authority (OCTA), will include a 66,000-square-foot station and the masterplan for a mixed-used area around it, set to not only consolidate and dramatically improve the region’s public transportation offerings, but to help spur development in Anaheim itself. THE LOFTY, COLUMN-FREE HALL WILL SOAR 150 FEET UNDER AN EXPANDABLE, ETFE MEMBRANE. In its first phase, the project will be designed to host Amtrak and Metrolink commuter lines, local and regional bus lines, airport shuttles, taxis, and tour buses. In later phases the center will be equipped to host California high-speed rail from the north and south, and possibly another line from Las Vegas, as well as connections from Disnleyland’s Monorail system. Anaheim Director of Public Works Natalie Meeks said that if anticipated federal high-speed rail funding comes through next fall, she expects that HOK would be the architect for the high-speed rail portion of the station as well. The complex is set to complete its EIR process in 2010, begin construction in 2011, and open in 2013. ARTIC will be located in the middle of what is known as Anaheim’s Platinum Triangle, a developing cluster of civic, entertainment, retail, and residential zones near the 57 Freeway that includes Angel Stadium, the Honda Center, and the Grove of Anaheim. The new station’s vaulted design, said Ernest Cirangle, HOK Design Director, was inspired in part by grand, open rail stations like Grand Central in New York, and from the monumental—and breathtaking— hangars in nearby Tustin, designed to house Navy blimps during World War II. The column-free station will be supported with long span triangulated steel members inset with a pillow-like ETFE membrane. A lofty, wide open hall—with a ceiling measuring over 150 feet—will be surrounded by shops and ticket booths, and bordered on its southern end by train platforms and tracks. “We wanted to celebrate the new interest our country has in improving its rail transportation,” said Cirangle. “So we wanted the building to be noticeable from a long distance,” not to mention from inside, where visitors' eyes will be drawn up to the ceiling. The project is aiming for a LEED Platinum rating, with green elements integrated into the structure itself. 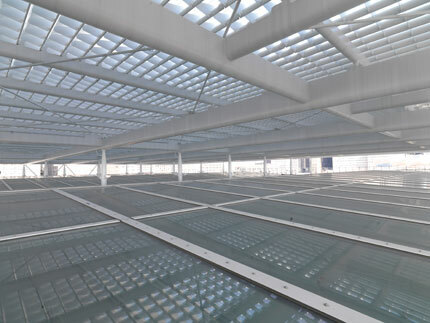 For instance, as planned, the ETFE surface will expand and compress to control natural light, and it will also be fitted with photovoltaics and solar hot-water heating cells. THE SCHEME, WITHIN ANAHEIM'S PLATINUM TRIANGLE, WOULD BE SURROUNDED BY HIGH-DENSITY, MIXED-USE DEVELOPMENT. The remainder of the site around the station will be masterplanned for office, retail, and high-density housing. That portion of the project does not yet have a completion date, and will depend on market recovery, said Meeks. In its proposal HOK outlined plans for what Cirangle called a “pedestrian oriented, vibrant place” set around a large public plaza, a sweeping promenade, and a riverfront park. California’s state-run, high-speed rail project—which when completed should run from Sacramento down to San Diego (but first from San Francisco to Anaheim)—is still in its infancy, but Anaheim is eager to begin, despite the fact that federal funding is still pending. Anaheim Mayor Curt Pringle, who has been working to get a transit hub in the area since taking office six years ago, said that Orange County has already done more preliminary engineering on its segment of the project than any other location in the state. California voters passed almost $10 billion in funding for high-speed rail last November, but that is contingent on matching federal stimulus funds that will be doled out this fall. Architects in California will be watching eagerly as commissions for more transit centers become available. But even if high-speed rail doesn’t happen, the ARTIC is already set to transform the region, said Pringle. Funding for ARTIC is coming from $82 million in county Renewed Measure M funds (a half-cent sales tax extension passed in 2007), $58.8 million from Proposition 116 (a state bond), and about $29 million from the State Transportation Improvement Program. Meeks noted that public support for the project is high, despite present economic conditions. “It’s a fully funded project with money that’s restricted to transit uses,” she said. 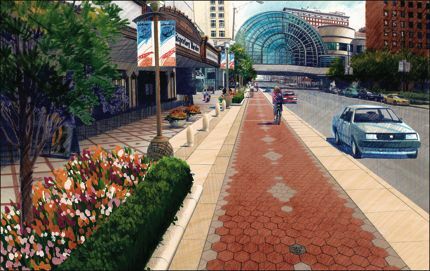 A rendering of the new Indianapolis Cultural Trail, which dedicates large swaths of city streets to biking and pedestrians. The revitalization of Central Indianapolis created several thriving “cultural districts” in the downtown area, anchored by institutions such as the Indiana Repertory Theatre and the Indianapolis Symphony Orchestra. These districts are disconnected by distance and by gaps in the urban fabric, but the Central Indiana Community Foundation has developed a plan to fix that: the Indianapolis Cultural Trail. A unique urban loop linking the cultural districts together with fully segregated pathways for pedestrians and bicyclists, the trail is to be carved out of 18 to 36 feet of space on eight miles of downtown streets. Beyond pure functionality, the foundation wanted to “create an inspiring space for people,” according to president Brian Payne. A short teaser segment of the trail opened last year. The major northeast segment recently broke ground. It will connect the Cultural Trail to the Monon Trail, the city’s principal rail-trail. A northwest segment linking to downtown’s Canal District and the Indiana University-Purdue University Indianapolis campus will also be built this year. The trail will also feature $2 million worth of public art and a bike-share system modeled on the Paris Vélib. To maintain, market, and improve it over time, $5 million of the $55 million budget is being set aside as an endowment to support the trail, with the non-profit Indianapolis Cultural Trail, Inc. formed to manage it. The trail is largely being built with $40 million in private funds and $15 million in federal funds. The trail is not costing city taxpayers anything. “This is bigger, bolder, and more beautiful than any urban trail being built in the world today. In terms of impact, we hope this will be our Millennium Park. Only this is more innovative,” claimed Payne. a landscape architecture firm, Rundell Ernstberger Associates. As principal Kevin Osburn argued, “Architects don’t think first about cars; we think about everybody.” Osburn’s design features a two-way bicycle trail separated from the street by landscaping and “rain gardens” used for green stormwater management, then another landscaped buffer and a completely separated pedestrian pathway for much of the trail’s length. The trail makes extensive use of native plantings, and is in effect a linear park. The width is made possible by the city’s wide streets. Indianapolis was laid out as a grand capital city by Alexander Ralston, a one-time assistant to Washington, D.C.’s famed planner Pierre L’Enfant. These wide streets meant lanes could be taken away from cars without reducing the level of service. Osburn was inspired by the city’s George Kessler–designed greenway network, and the trail is intended to be the downtown hub of that system. He specified high-quality materials such as concrete pavers instead of a plain asphalt path, and dense, low-mast street lighting to make the trail feel safe 24 hours a day. The loft-like spareness of the galleries was achieved in part by housing all mechanicals in six-foot-nine-inch-thick walls, leaving the ceilings relatively unencumbered. Since its first permanent structure, the Allerton Building, opened in 1893—and through each of its subsequent expansions—the Art Institute of Chicago has displayed a strong dedication to exhibiting its collection under diffused natural light. The institution’s latest addition, the 264,000-square-foot Modern Wing designed by Renzo Piano Building Workshop, is perhaps the most thorough exploration of that commitment yet. While every previous structure in the complex—from the original Beaux Arts palace to the 1988 Daniel F. and Ada L. Rice Building—has been constructed in limestone, Piano’s contribution is an ode to steel and glass, serving as a link to the city’s legacy of modernist highrises as well as an embodiment of ethereal lightness. To achieve this razor-thinness and transparency, the design team from Piano’s office, along with associate architect Interactive Design and engineers at Arup London, relied on a composite structure containing both reinforced concrete and steel sections. 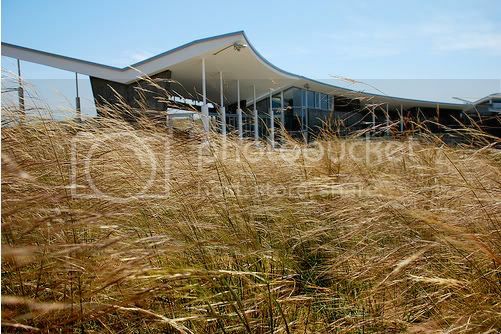 The eastern pavilion of the building that houses an education center and galleries is the most interestingly configured. The first two floors are framed in a combination of poured-in-place concrete and pre-cast concrete T-sections, which create 54-foot clear spans for the galleries. The choice of this material also allowed extremely narrow floor profiles, which were trimmed even further by omitting any horizontal HVAC ducting within the space. All of the ventilation flues, as well as the concrete T-sections, were run vertically within a series of north-to-south running double walls, each measuring six-feet-nine-inches thick. Air is moved through slim vents running at the tops of the walls, and the only mechanicals left to clutter the ceiling were the sprinkler and smoke detection systems. Nonetheless, the building’s spandrels were kept to an attenuated ten inches. Piano's daylight-diffusing device, the flying carpet, is composed of east-west running aluminum blades and north-south running aluminum fins, all welded to a grid of steel. From the third floor to the roof, steel takes over for a smooth transition to Piano’s daylight-diffusing system, the “flying carpet.” Tapered tubular columns, on average 14 inches in diameter, rise from the concrete floor to meet, in exposed pinned connections, the grid of aluminum and glass that shelters the building. The flying carpet is composed of pre-mounted cassettes of aluminum blades running east and west. Aluminum “dorsal fins” run perpendicular to the blades at greater intervals to maintain the diffusion of light throughout the day. The grouping of blades was also varied depending on what space they cover. Above the modern collection galleries, the blades are grouped more closely to better break up the light, an effect that is doubled by a layer of vellum that stretches across the top of the gallery. Above Griffin Court, the blades were spaced to allow greater light into this public gathering space. The building also features two double-glass curtain walls on the north and south facades. Featuring two-and-a-half-foot-deep cavities, these walls increase the wing’s insulation values while maintaining its transparency. Again, thinness was key. The stick-built system was hung from above rather than supported from below, because when a structure is in tension, the profiles of its framing members can be kept slimmer than when it’s in compression. Even so, since some of the spans supporting the mullions reach as much as 35 feet, the fabricator, Gartner, specified both steel and aluminum members. 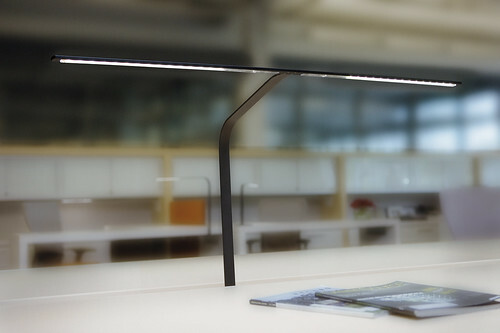 The panels of glass themselves—laminated, low-iron units with UV filtering properties and high color-retention films—are also slim, as little as two-feet-three-inches wide by 19 feet long. All of the glass had to be fired in Europe, as there are no domestic kilns capable of producing such sizes. Edward Lifson explores the Modern Wing. A recent decision by the Inglewood City Council has paved the way for a real estate development to replace Hollywood Park, one of California’s few remaining thoroughbred racetracks. After the council approved a final environmental impact report and zoning change for the $2 billion, 238-acre project on June 3, preservationists and horsing racing fans have been chomping at the bit to stop it. The proposed project in the densely populated South Bay region of Los Angeles would create a new neighborhood with 3,000 residential units ranging from market rate single-family residences to multi-level apartment complexes. Commercial, retail and entertainment components are also planned, as well as 25 acres of open space highlighted by an existing lake in the center of the racetrack. An existing casino would be updated and joined with a new 300-room hotel. Affordable housing is not currently incorporated into the master plan, but according to council member Ralph Franklin, the city will consider using the four acres put aside for civic use to develop housing for low-income residents. A proposed redevelopment plan for Hollywood Park would replace everything but the tower-topped casino in the background. Wilson Meany Sullivan is the developer of both Hollywood Park and Bay Meadows, a San Mateo racetrack that was demolished in 2008 to make way for a real estate venture resembling the one proposed in Inglewood. But the 82-acre development has come to a halt as a result of the economic downturn and is on hold for the time being. Currently, all that remains of historic Bay Meadows is a mound of concrete rubble. That’s what worries opponents of the Hollywood Park development. The housing market in Inglewood, like the rest of the nation, has dropped out in the past year and there are already more than 500 homes in foreclosure within the same zip code as the proposed development. Diane Becker, a vocal advocate of the park and founder of Save Hollywood Park, says she does not understand how the city could allow the destruction of the landmark racetrack in light of what’s happened at Bay Meadows. “I would think any city would love to have something like this [racetrack]. It just doesn’t make economic sense to tear it down. Hollywood Park is too important,” she said. Becker and a group of Hollywood Park supporters have been lobbying city hall, insisting that the destruction of the 71-year-old track will be a significant economic and cultural loss for Inglewood. Becker said she did not rule out future lawsuits to try to stop the project from going forward. She and the other supporters of the track see the mixed-use development as contributing to urban sprawl, adding nothing of architectural significance to the region. Tyrrell sees the development as urban infill and a way to intimately stitch together neighborhoods that are currently separated by the expansive grounds and asphalt parking lots. He says the team chose to focus on a variety of typologies rather than a specific architectural style in an effort to create a diverse aesthetic that might appear to have grown more organically. They emphasized the relationships between buildings, streets, and greenways, placing less prominence on the car. “The plan creates walkable, transit-oriented neighborhoods with a lot of open space,” Tyrrell said. 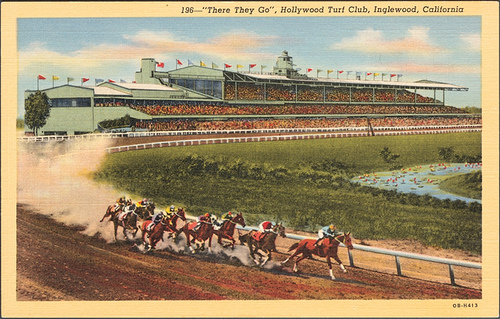 A postcard of the racetrack from the 1940s, during its inaugural decade. A few zoning issues remain to be resolved by the Inglewood City Council, such as rezoning the site away from commercial recreation, and approving proposed general land use amendments. A final public hearing on July 8 is expected to resolve these matters. Once finalized, Hollywood Park will remain open at least one more year, or until construction on the development can actually begin.